Tilden’s science program is an inquiry-based, material-rich program centered on hands-on experimenting, investigating, applying, reflecting, and explaining discoveries. Students grow into self-directed learners with a real understanding of how the world of science is relevant to their everyday lives. 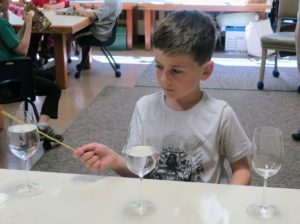 The science program is built on a base of fascinating and effective research-based science kits, including Insight Guides, Science & Technology for Children (STC)™, Full Option Science System (FOSS Next Generation), and Lawrence Hall of Science GEMS Kits® (University of California, Berkeley). A strong theme underlying learning at all levels is understanding and using the scientific method: conducting fair tests, collecting quantitative and qualitative data, and recording accurate observations. Students develop important skills as scientific writers by reflecting and explaining their thinking in science notebooks and sharing their findings through expository writings. Taking, and doing, science outside is valued for the concrete and contextual connections students can make with the natural world. Kindergarten scientists focus on learning to be careful and accurate observers and reporters of what they are actually observing, not just what they expect is happening. Introductory level life science units include exploring elephants and using the most fundamental scientific tool—our senses; observing and recording weather; comparing planets in the solar system; and practicing measurement of weight and volume. First grade scientists learn to develop logical explanations from physical evidence, instead of jumping to conclusions. Some of the ways they hone their skills include studying force and motion in a balls and ramps unit; building harps and guitars to understand how vibrating objects and air cause sound; exploring what separates living organisms from non-living things; and getting a first taste of mystery solving and forensic science by finding and testing clues from a mock crime scene. Second grade scientists learn to observe carefully, keep accurate records, quantify data, and synthesize information from multiple, and long-term, investigations. Primary themes include understanding and identifying the characteristics, properties, and interactions of liquids; testing and identifying all things soil—decomposing plants, worms, and roots; and using balance beams and equal-arm balances to explore measurement and calibration. Third grade scientists take their exploration of the scientific method to the next level running control groups to test hypothesis and practicing field identification techniques. 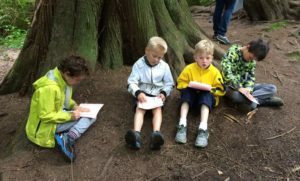 They focus on the distinctive stages of the life cycle of plants and the other living things plants need to survive and thrive; and explore how rocks and minerals are formed, and the role they play in our lives. Fourth grade scientists take on global issues, more complicated experiments, and the concept of Systems Theory. 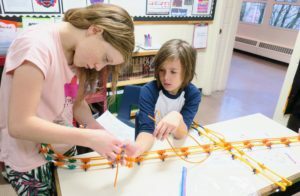 They delve into how individual parts work together in larger, complex systems by studying land and water ecosystems and pollution; holding a round-table debate on water use and rights in the Puget Sound area; designing their own experiments to study electricity and circuits; and using teamwork, troubleshooting, and K’NEX to build and test vehicles in a study of motion and design. Fifth grade scientists dig into real-world issues and big ideas that push them to think beyond their immediate community to the larger environment. They build stream tables and take field trips to study water cycles and watersheds; make a four-day visit to IslandWood, an environmental learning center on Bainbridge Island, to learn about the local ecosystem and its rich history; and use engineering, troubleshooting, and critical thinking in a models and design unit that culminates in designing and launching rockets.